My Auntie Lesley went to Turtle Island and learned lots about my loggerhead relatives. She loves turtles and tortoises, so she wrote this page to tell you how you can help to keep loggerhead turtles safe. Even if you don't live by Turtle Island, if you live near the ocean, you can be a turtle helper. Loggerhead turtles eat molluscs, crustaceans, fish, jellyfish and other small to medium-size marine animals, which they crush with their large and powerful jaws. Most loggerheads that do reach adulthood live for more than 30 years, and can often live past 50 years. Their huge jaws mean that the loggerhead turtles have only three predators. Great white sharks and killer whales kill some but there’s one other predator that is the most destructive and dangerous in the world and is endangering the existence of many other animals besides the turtles. Can you guess the name of this terrifying animal? Humans. One of the turtle’s favourite foods is jellyfish. The guide on our trip told us to be very careful with our possessions and not to drop anything over the side of the boat. He explained that a plastic carrier bag floating in the sea looks very like a jellyfish to a turtle. Plastic bottles look tasty too, so the turtles just swallow them down. Many hundreds of turtles have died a long and painful death from swallowing carrier bags and bottles that have been carelessly left on beaches and then blown into the sea. The plastic clogs up their digestive system and the poor things starve to death. Shelly says: National Geographic made a video about loggerhead turtles. You can see one trying to eat plastic. First you have to watch an advertisement. The other major danger is from speedboats and fishermen. The turtles get caught in fishing nets and drown or they swallow fishing hooks and die from infections and starvation. Speedboat propellers often injure adult turtles. The turtles like to swim just below the surface of the sea, about a metre down. That makes them very difficult to see from a low, speeding boat. 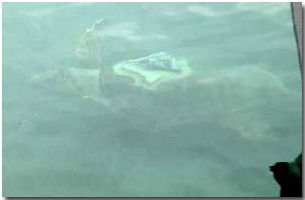 Notice how hard it is to see a loggerhead turtle swimming in the sea. On our trip we saw only one turtle. It was swimming about in the harbour and had been seriously injured by a speedboat propeller. Someone had seen the turtle and rescued it. It was then taken to the rescue centre in Athens where it was cared for and given surgery to repair the holes in its shell. When it was well enough, the rescue centre staff fitted a satellite tracking device and then brought the animal back to the harbour in Laganas and released it.